When being a home renter, the one thing you really can't do (unless you intend on renting there a long time) is change the decor. Whether it be wallpaper from the 60's, paint that is chipping off, you really just can't do it unless the owner REALLY likes you. In our home, our daughter's bathroom looks like it's straight out of the 60's with crazy floral almost dizzying, dismal, dinginess. I had no idea how I'd find anything that wouldn't clash but then the opportunity to review from Paper Ramma came. The set that I received fits so well for so many reasons and now I get to show you! First thing I want to point out is these are 8x10's, and the quality of the print is fantastic. You do not see any pixilation or blurriness in any way from the printer being a simple inkjet. Secondly, the paper is thick, so you can't easily bend these if someone let's say...a hyper four year old gets a hold of them. Then third, the colors are vibrant, beautiful, and although the images are opposite each other with one warm and one cool they match perfectly. 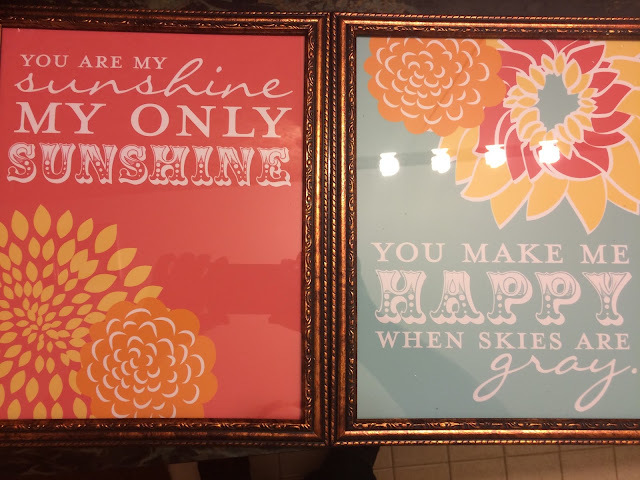 After finding frames for them, we decided they were definitely going in our daughter's bathroom. Almost embarrassing letting you all see that wallpaper. First day we moved in I went in there in the middle of the night and I thought the walls were rotating! As you can see these prints actually match though! The font styles feel almost older, retro and the colors blend with the floral background. I think the only thing that's missing is in the middle I think I'll be making some kind of floral arrangement or something. I just love how these images really do help with the flow of the room and you know they will look great in yours! You can find this set on their website in multiple colors such as Navy or the two-tone set you see here for $30.00. I recommend getting this for your child's room seeing as every parent sings this song to their child at least once every few days. It's actually a part of my daughter's "nightly song routine" that Mommy has to sing to her so she can sleep. Hurry and get yours today! I see what you mean about the wall paper, but it's very retro though! I love the 2 prints you got and they do rather set off the wall paper. I used to sing to the kids too! Those are really nice prints! I would like to have similar ones near my study area because the right colours are uplifting. I have never used wall paper. I think about how hard it is later to remove it. But those look beautiful! Thats great that it comes on high quality paper! Always important in my opinion. I love those prints and that they come on high quality paper. Renting is hard when you can't decorate the way you want. I am glad you found a way to at least add some personal style. You got very nice prints, I love the colors and I think it is a great accent to my dull walls. I actually kind of love the wallpaper! The prints look great with the pattern too. I love the prints! It goes well with your wallpaper. The colors are vibrant and stand out at you! We haven't used wallpaper in a long time! It's really nice to look at those prints, it just adds life and some fun to the room. I love the frames that you added, it really fits well. The prints look really nice with the wallpaper. You are right. You can't change the wallpaper so make the most of it. wow. these prints are amazing. it actually reminds me of some really pretty fabric my mom just bought recently. i love it. I love wallpaper! It gives the home a really homey feeling in my opinion!